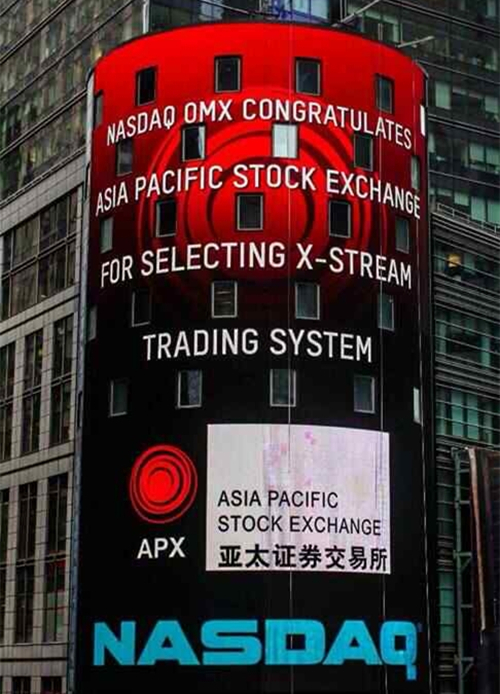 NASDAQ OMX congratulates Asia Pacific Stock Exchange for selecting X-stream trading system. The NASDAQ OMX trading system has finished its test phase at Australia’s Asia Pacific Stock Exchange (APX) and will go online by March 9, 2015, said the APX in a statement. The APX will benefit from this upgrade platform as it seeks more investors and listed companies because the system can enable more securities companies to trade different assets at a lower cost. “APX arranged a tight schedule of testing the OMX trading system since it announced that it would adopt it in June. The system will go online by March 9, 2015, after stock brokers’ tests,” said APX CEO David Laurence. Laurence said the APX will also try to enter overseas markets, especially China, which has the brightest economic prospects. The APX will provide a high-quality service as well as a market with much transparency and appropriate liquidity for listed companies in Australia. More than 20 stock exchanges have adopted the NASDAQ OMS system, including the Australian Securities Exchange and the Stock Exchange of Hong Kong. The APX was acquired by AIMS Financial Group in 2008 and staged a comeback in March, 2014. Australia Samly Holdings Group Limited (APX Code: 8SA) and ZHY Holdings (APX Code: 8ZH), both with a Chinese background, went public on the morning of March 6 after the approval of the ASIC and APX. The APX has devoted itself to providing diversified financing channels for real estate investment trusts, mining companies and prospective enterprises.